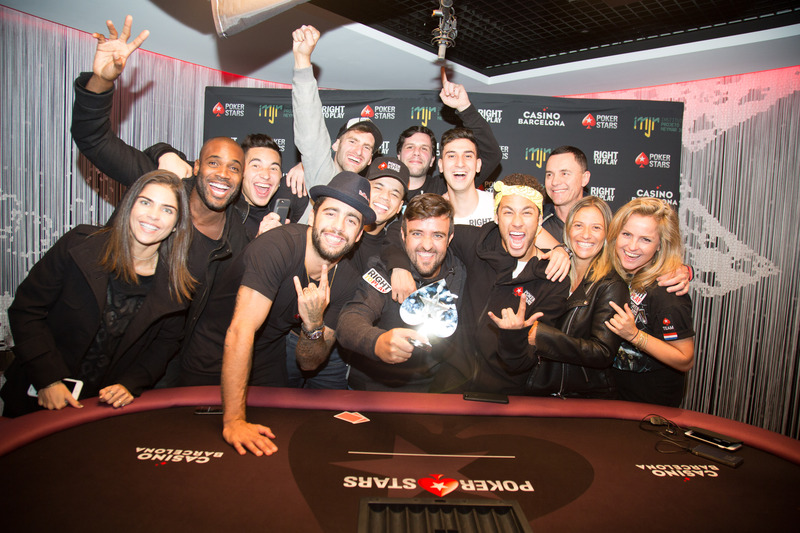 ONCHAN, Isle of Man – March 20, 2017 – Team PokerStars Pro Andre Akkari was the star of the Neymar Jr Charity Home Game held in Spain on Thursday night, defeating a field of 15, winning the trophy and a piece of the €52,300 prize pool for his charity. Neymar Jr and his friends competed for a slice of the prize pool in order to donate the winnings to Neymar Jr's own charity, The Neymar Jr Institute. Olympic hockey star Fatima Moreira de Melo and Andre Akkari, both members of Team PokerStars, an Amaya Inc. (Nasdaq: AYA; TSX: AYA) brand, played for children’s charity Right To Play. Team PokerStars SportStar and football legend Neymar Jr invited friends and stars from the world of sport and screen, as well as fellow members of Team PokerStars, to come together at Casino Barcelona for a social, charity, poker game. As well as Olympic gold medal hockey player Fatima Moreira de Melo (who finished 12th for €1,000) and WSOP bracelet winner Andre Akkari (who won €15,000 for first place), Brazilian actor Rafael Zulu (11th place, €1,250) and Brazilian pro surfer Pedro Scooby (9th place, €1,500) joined Neymar Jr on the felt. Fans can check out all the action from the star-studded home game in a video posted on Neymar Jr’s Facebook page. Online qualifier Diego Garcia Bello from Galicia, Spain, also joined the superstar footballer and friends for his first ever live poker tournament after winning his place in the home game for free at PokerStars. Bello, who made the final table, left with his head held high in 7th place and donated €2,300 to charity. Helping Hands is the PokerStars and Full Tilt Corporate Giving Programme which provides support to charities whilst galvanising the support of the brands, players and staff. Helping Hands is the embodiment of the Full Tilt and PokerStars ethos that working with our communities and our people to make a difference is an essential part of being a responsible business and the right thing to do. Helping Hands works with charities locally where we have an office presence and globally through our charity partners such as CARE International and Right To Play – helping to recover from international emergencies and using the power of sport and play to transform children’s lives. Since its launch in 2013, Helping Hands has contributed more than $7 million to charities around the world. PokerStars and Full Tilt are ultimately owned by Amaya Inc. (Nasdaq: AYA; TSX: AYA).